Exquisitely designed stage piano with an incredibly realistic sound and a rich, dynamic response. The Kawai MP7SE is a stage piano for the discerning professional. With a class-leading keybed action, hundreds of incredible sounds and superb real-time control, the MP7SE will deliver a magnificent performance on any stage. The tones are stunning, including acoustic pianos, vintage electric pianos, and a classic tonewheel organ, and with its masterful MIDI control and Impeccable feel, the Kawai MP7SE is the stage piano for the professional musician that does not accept compromise. The keyboard is one of the most important components of any piano. It’s where the player literally connects with an instrument to express their feelings, and where the magic really happens. Ask any stage performer, be they a concert pianist, a touring artist, or a weekend warrior–if the keys don’t feel right, it’s impossible to enjoy the music and put on a great show. 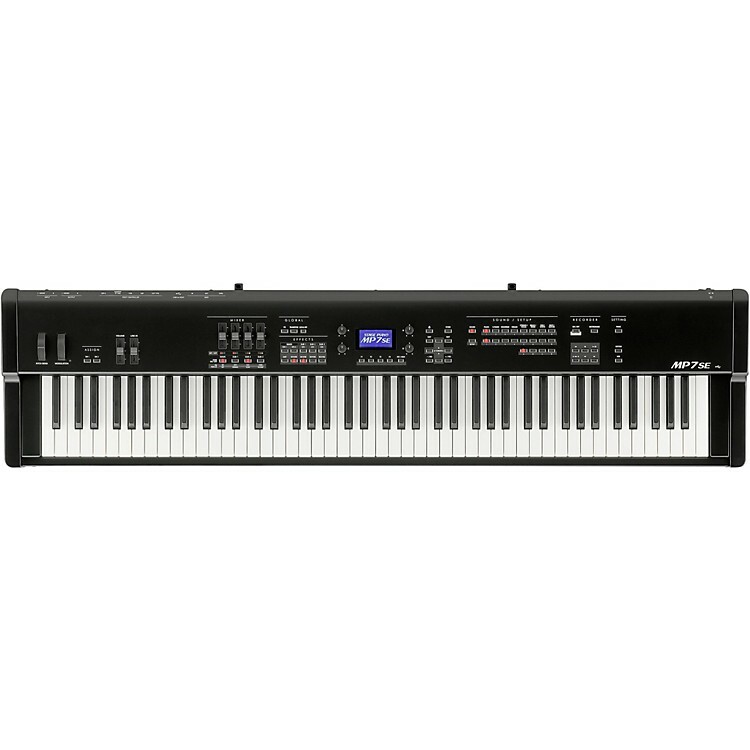 This is why Kawai has selected the class-leading Responsive Hammer II keyboard action for the MP7. This advanced mechanism recreates the supreme touch of an acoustic grand, with grade-weighted hammers, Ivory-like key surfaces, and a well-cushioned, springless design. The result is a smooth, natural piano playing experience that feels like the real thing. The MP7’s Responsive Hammer II action adopts many of the characteristics of a grand piano keyboard, including hammers that are graded in size and weight to mirror the heavier bass and lighter treble notes of an acoustic. Even the shape of each hammer is specifically designed to optimize its center of gravity. Pushing down on a key causes the corresponding hammer to rise at a rotation angle similar to that of a grand piano hammer, while releasing the key allows the hammer to fall naturally with gravity, and for the key to therefore return to its original position without the use of springs. The MP7’s class-leading Responsive Hammer II keyboard delivers one of the most authentic playing experiences available in a stage piano. However, a great action counts for almost nothing if the sound quality doesn’t measure up. Fortunately, superb sound is another area where the MP7 truly shines, with premium voices that cover a stage performer’s ever need. Stunning acoustic pianos, cherished vintage EPs, classic tonewheel organs, and a wide range of other inspiring subsidiary voices. The flexible MP7 features more sample memory than all of its predecessors combined, with a brand new digital signal processor providing some of the most realistic reverbs, resonances, and effects ever heard in a portable stage board. Expanded sound memory allows the MP7 to deliver some of the finest multi-layered, 88-key, extra-long samples available in any stage piano. However when combined with the instrument’s new audio processor, sonic realism is elevated to another level. This advanced hardware is responsible for enriching the core sounds with subtle resonances that enhance playing authenticity, and reverbs that build depth and character. The MP7’s effects system has been completely rewritten in order to take full advantage of this additional processing power. While most stage pianos offer a handful of effects and limited control, the MP provides over 100 effects (sorted by category), with a wide range of tweakable parameters. Effects can be applied to each zone independently, with the MAIN zone afforded two separate effect blocks for greater flexibility. Exceptional value, magnificent performance, order the Kawaii MP7SE today!